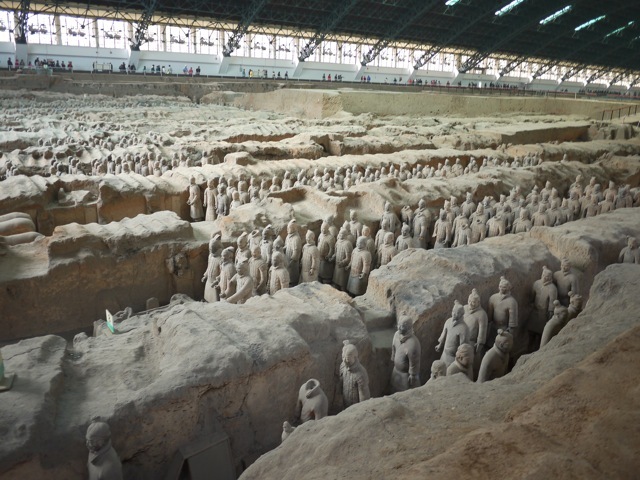 In the case of the First Emperor, plenty does remain, and yet the hubris is the same in the idea that these thousands of soldiers – over 6,000 buried in this one pit alone – could go with him to the afterlife and continue his life of conquest. For over two thousand years, no-one knew they were there and they would probably still be buried if a peasant had chosen to dig his well elsewhere. Around a kilometre away is the Emperor’s burial mound. It hasn’t been excavated, for fear of destroying fragile artefacts. Legends tell of a vast underground complex recreating the world above with rivers of mercury and ceilings studded with pearls for stars. It doesn’t attract many visitors as the pits containing the warriors because there is little to see. It is just a large mound covered with vegetation and it was peaceful on the beautiful spring day that we strolled along the tree-lined walks around its base, feeling the sun on our faces and listening to the birds singing.